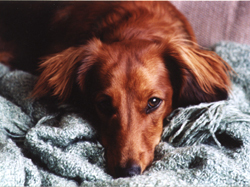 Remy was a male miniature red long-haired dachshund, who joined our household in February 1998 as a companion for one-year old Brandy. Unlike Brandy, Remy was an energetic and mischievous puppy who loved hunting and digging in the backyard. 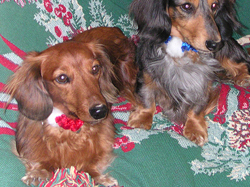 Remy was full of life and a loyal companion and partner. He loved practicing agility and obedience, playing with Brandy and Ouzo, and hunting for rabbits and mice in the backyard. This 1999 photo by Bertha Adamson was used many times in our "She's working late again..." ad campaign. 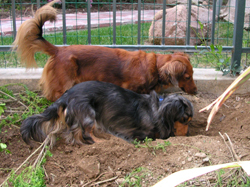 Remy and Ouzo digging a hole in search of gophers in our backyard. 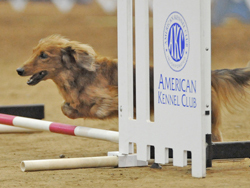 Remy's early success in AKC earthdog tests launched us into the world of dog sports. Remy was our Novice A dog in agility and obedience, and everything we do in dog sports is truly Remy's legacy. After six busy years training and competing in earthdog, agility, and obedience, Remy's life changed dramatically in October 2004 when he started having seizures and was diagnosed with ideopathic epilepsy. For the rest of his life, Remy would struggle with epilepsy, pneumonia, and finally, lung cancer. Through all the vet visits, hospitalizations, surgeries, and medication, Remy kept going -- continuing to love training, trialing and earning titles in agility, earthdog, rally obedience, field trials and freestyle dance. 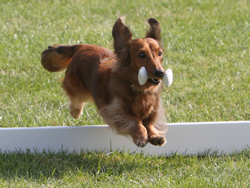 In his 12th and final year, Remy earned his PAX2 agility title, competed at the AKC National Agility Championship, and was the Dachshund Club of America (DCA) Triathlon Dog of 2010. 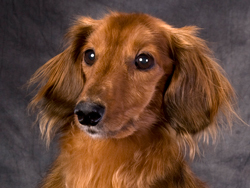 Remy died of lung cancer on December 21, 2010, during a rare lunar eclipse at the winter Solstice, and one day after competing in his last agility trial. Click here for "Remembering Remy" tributes in memory of Remy. Remy was quite the hunter and earned his Junior, Senior and Master Earthdog titles. Remy started his field career fairly late, but won two first places and earned his Field Championship in June 2007. 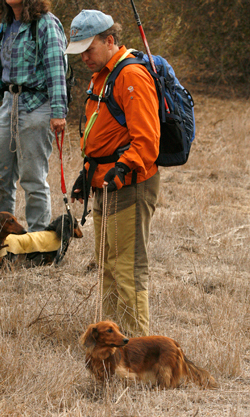 John and Remy on the Master Earthdog hunt in 2006. 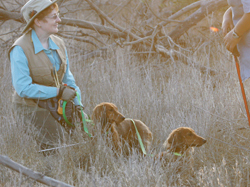 Diane with Asti and Remy at the DCSAV field trial in November 2008. 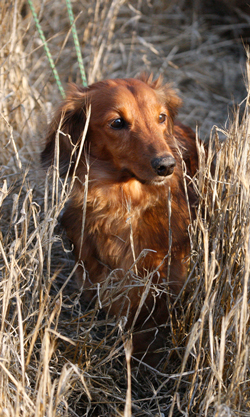 Remy at the DCSAV field trial in 2008. 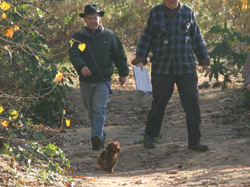 John and Remy wait their turn at the DCSAV field trial in December 2007. 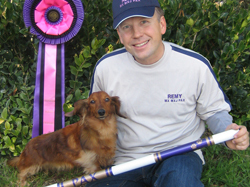 Remy started competing in AKC agility in December 2001 and received his Master Agility Excellent (MX) and Master Agility Jumpers (MXJ) titles in late 2003. Remy made significant progress towards his MACH (Master Agility Champion) title -- click here for details on Remy's MACH campaign. But between the seizures and the side effects of the medication, Remy had to move to Preferred agility in early 2005 and jump at 4" instead of 8". 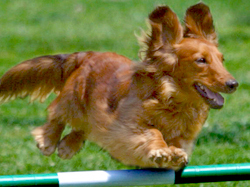 Remy loved agility more than any other sport and earned his PAX title, which requires 20 double-Q's in Excellent Preferred Agility, in January 2008. He also began competing in the new FAST class, and earned his Excellent FAST Preferred (XFP) title in December 2008. At age 12 1/2, Remy earned his PAX2 title on December 31, 2009. Remy was working on his Master FAST Preferred (MXP) title and ended his career with six of the ten required legs. 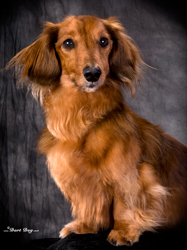 Remy was earned his Preferred Agility Championship (PACH) on March 21, 2009 and was awarded it posthumously in July 2011. Remy started training in competition obedience in June 2002 and qualified for his novice obedience (CD) title in November 2003. Remy started competing in Open obedience in 2004 but had a bad experience in the group stay ring and, despite several years of trying, was never again able to do group stays. Diane and Remy spent a couple of years training for Graduate Open towards the end of Remy's career. 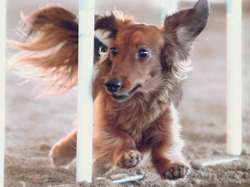 Remy was one of the first dachshunds to qualify for a Rally Novice (RN) title, qualifying on three straight days in January 2005 on the second weekend of AKC rally competion. He earned his Rally Advanced (RA) title a few months later in May 2005 and his RE title in October 2005. Remy valiantly struggled through drug complications, seizures and pneumonia to earn his RAE in late April 2006, earning several all-breed placements along the way. Remy earned his RAE2 on January 7, 2007 at the Kennel Club of Palm Springs trial, winning a 3-way tie for first place in the Advanced B class. 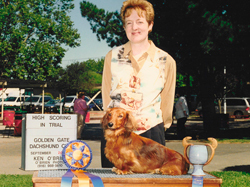 In September 2007 Remy earned his RAE3 among many of our dachshund rally comrades at the Dachshund Club of Santa Ana Valley trial, and his RAE4 at the Silver Bay Kennel Club trial in February 2008. Remy loved the dynamic nature and teamwork of rally, but after over 100 times in the rally ring, he finally got tired of all those sits! Remy earned his second Novice obedience leg and High in Trial in September 2005. Remy retrieving over the high jump at Top Dog in November 2009. 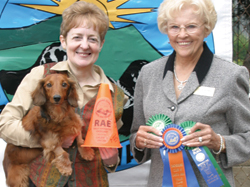 Above, Diane and Remy celebrate their RAE title with judge Shirley Indelicato in April 2006. At left, Diane and Remy heeling at the DCSAV rally trial in April 2005. The last sport that Remy took up was Canine Freestyle. 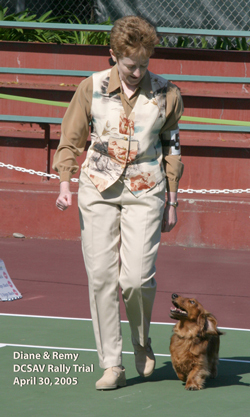 In March 2009 Remy and Diane earned their first freestyle title -- the Bronze Bar, Musical Freestyle, from the World Canine Freestyle Organization. Click here to see Remy's Bronze Bar routine.